Charity partners who worked with Churchill Downs Racetrack (“CDRT”) during this spring’s 141st annual celebrations of the Kentucky Derby Presented by Yum! Brands and Longines Kentucky Oaks were presented with donation checks for their Derby and Oaks Week activities that totaled $222,705. Kentucky Oaks women’s health partners Bright Pink and Horses and Hope and two participants in the Derby and Oaks Week “Taste of Derby” celebration – Louisville food bank Dare to Care and Sullivan University’s Center for Hospitality Studies Culinary Arts Program – received their donation checks during ceremonies in the G.H. MUMM Winner’s Circle during the June 27 “Downs After Dark” night racing program that concluded the track’s 38-day Spring Meet. A donation of $117,705 was presented to Chicago-based Bright Pink, which is now in its second year as the Kentucky Oaks’ primary health care partner. Bright Pink is the only national non-profit organization focused on the prevention and early detection of breast and ovarian cancer in young women, along with support for high-risk individuals. With the 2015 donation, Bright Pink has received $174,705 from Churchill Downs through its Kentucky Oaks partnership. Local ambassadors Leigh Anne Autullo and Maureen Osak accepted the donation on behalf of Bright Pink. The Kentucky Oaks engaged its first women’s health partner in 2009 when Churchill Downs adopted its “Ladies First” theme for America’s premier race for 3-year-old fillies and created the day’s “Pink Out” fashion theme. Churchill Downs has donated $706,705 to its primary Kentucky Oaks women’s health partners since 2009. A donation of $30,000 was presented to Horses and Hope, the cancer outreach initiative in Kentucky’s horse industry launched by Kentucky First Lady Jane Beshear. The donation represents $1 from each on-track sale of the “Oaks Lily,” the signature drink of the Kentucky Oaks, and supports Horses and Hope’s programs and outreach at racetracks and farms in Kentucky’s horse industry. With its 2015 donation, Churchill Downs has donated a total of $210,000 to Horses and Hope during its seven-year Kentucky Oaks partnership. The Horses and Hope donation was accepted by two key members of the First Lady’s “Pink Team”: retired jockey and breast cancer survivor Patricia “P.J.” Cooksey and Connie Sorrell, the director of theKentucky Cancer Program’s West Office. 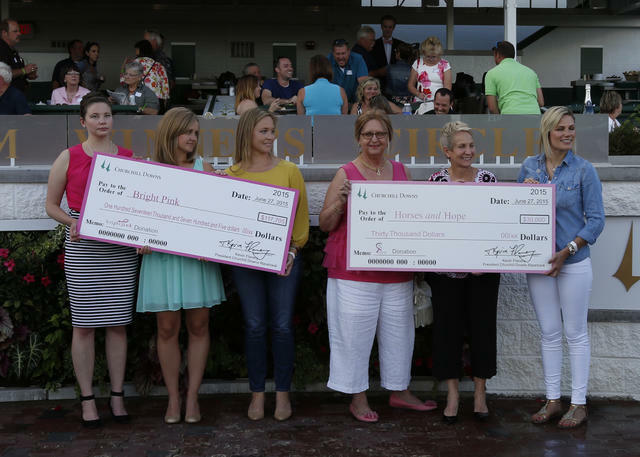 The donations to the Kentucky Oaks women’s health partners were presented by Lauren DePaso, Director of Community Relations for Churchill Downs Incorporated (“CDI”), and Elizabeth Wester, CDI’s Vice President for Corporate Relations and Government Affairs. Two donations grew from the fifth annual “Taste of Derby Presented by Stella Artois” celebration in the North Wing Lobby of Kentucky Fair and Exposition Center on Thursday, April 30. “Taste of Derby” highlights racing cuisine, celebrity and style and the event attracted more than 1,500 patrons. Louisville-based food bankDare to Care received a donation of $50,000as a partner charity in “Taste of Derby” since 2010. During that period Dare to Care’s proceeds from the partnership will generate more than 200,000 meals in Louisville Metro and the region. Since the inaugural “Taste of Derby” in 2010, Churchill Downs has donated a total of $138,760 to Dare to Care. The donation was accepted by Remy Kenney, Dare to Care’s corporate relations manager. Also receiving a “Taste of Derby” donation was the Sullivan University National Center for Hospitality Studies Culinary Arts Program, which was presented a check for $25,000.The award for the program on Louisville’s Sullivan campus recognized “Taste of Derby” support by the Culinary Arts Program, which opens its kitchens to visiting chefs who participate in the annual Derby and Oaks Week event, and the program’s students gain significant experience while assisting in the event. The donation to Sullivan University’s Culinary Arts Program was accepted by Chef Allen Akmon, the program’s chair, and program students. This year’s donation will be used for scholarships for students in the program. Donations to the “Taste of Derby” charity partners were presented by Mark Stone, Director of Events in Churchill Downs’ Group Sales, and Christie-Leigh Mueller, Churchill Downs event manager.